Posted at TST #6, I showed you the block that I contributed to an international block exchange. Despite making sufficient blocks for the exchange, I also made additional blocks. Why? My mother had been very supportive of my quilting hobby/habit/obsession. She had help me pick fabric and patterns for some of my past projects. She was amazed at the number of participants that had joined the exchange. 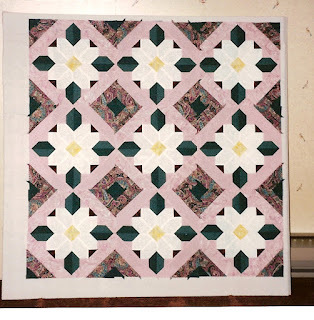 She liked the block so much that I made a wall hanging from the extra blocks and hand quilted it. It was completed in December 1996 and hung on her bedroom wall. As a representation of the provincial flower of British Columbia where we lived and a reminder of the postcard depicting the dogwood that my father had once sent to us, it must have made her heart sing. 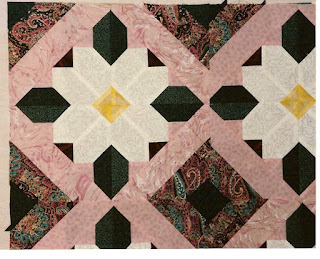 This is a gorgeous quilt and the colour combination is excellent, I love paisley!